I know how it feels to get published. I think for an aspiring photographer, it is one of the initial accomplishments to see their photos on print with their name on it. With photography very accessible to everyone lately, it’s so easy to get into the field. But wait! It is also a hive for some publishers and companies to take advantage of young and aspiring photographers wanting to break into the field. “Give us your photos for free and credit you for that”, they say. That’s just cheap. Would you give your image for free and multiple use for a credit? I’ve been aware of some publisher’s practice for some time now. Some publishers would search for flickr and would flatteringly praise your work then ask if they can publish your work – for free or an undisclosed “token”. And there was even a time when an image was blatantly stolen and published even if the photographer said no. Of course any aspiring photographers would be excited with the prospect. But think about these for a moment here. If they got advertising or they will sell their work with your photos on it, it should follow that that you should be properly compensated for that. 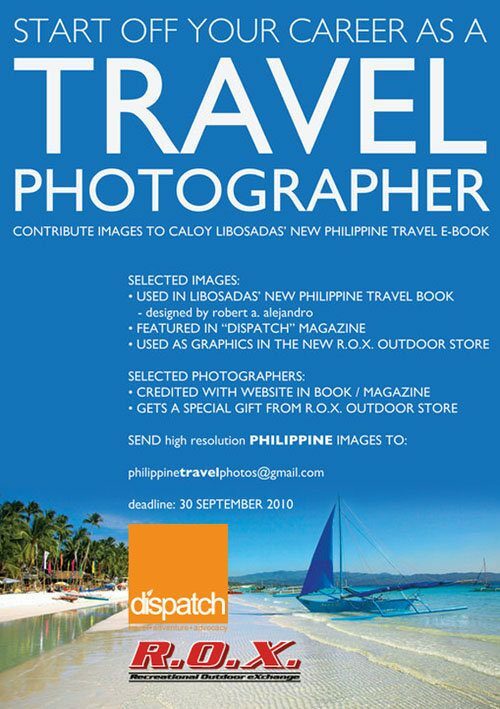 I have been quiet about this issue for some time now until I saw this e-poster with the header “Start off your career as a Travel Photographer” which is a blatant display of taking advantage of young photographers out there to contribute images for free. I have nothing against the people behind this but it certainly leaves a bad taste for the industry. Of course, whatever I say here, the end decision is always on the photographer if they will fall on this bait. But think again, it will cheapen the industry. wow naman! ang ganda ng tagline nila, “start off your career as travel photographer”. tsk! tsk! pananamantala na ito. btw, if they can exchange TNF Jacket or Deuter Backpack para sa photo ko e pwede na din. hahaha! dapat may exdeal or something.